Raise your hand if you are a crazy dog parent like me? Okay, so a lot of you! Say hello to our four legged goofballs Juno (left) and Okra (right). When you are a dog parent, you turn into another being when interacting with your pups; making weird voices, noises, and acting a fool (or normal as I like to call it). Because we are crazy dog owners, we tend to spoil our best friends with healthy food, not-too-healthy treats, fancy collars, loads of toys, dog bowls, and much more. Outside of those normal niceties we do for those fluffy canines of ours, we can also design parts of our home with them in mind. 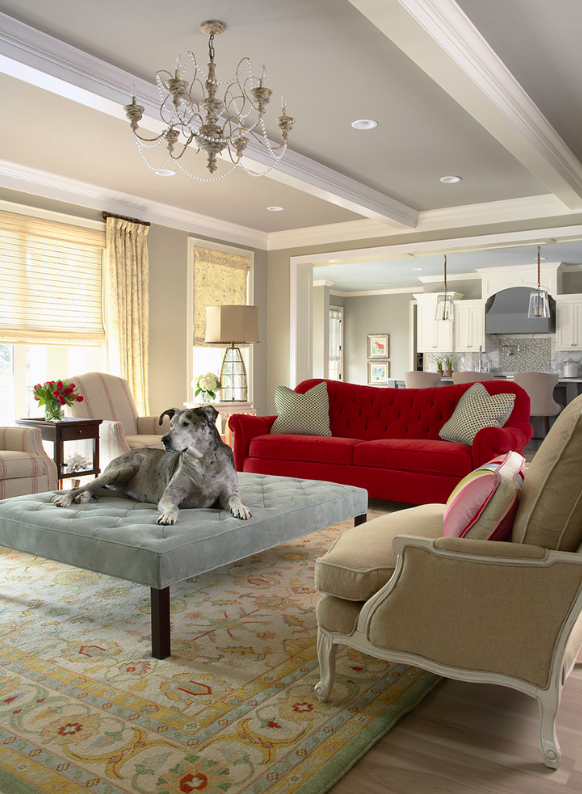 Here are some fun ways other crazy dog lovers have kept pets in mind when designing different areas of their homes. Two barstool and a nook for the pup. A great idea for that dog who wants to be next to you at all times. Built in dog bowl at the end of your cabinets is perfect for clearing up floor space and conceiling Fido's food. 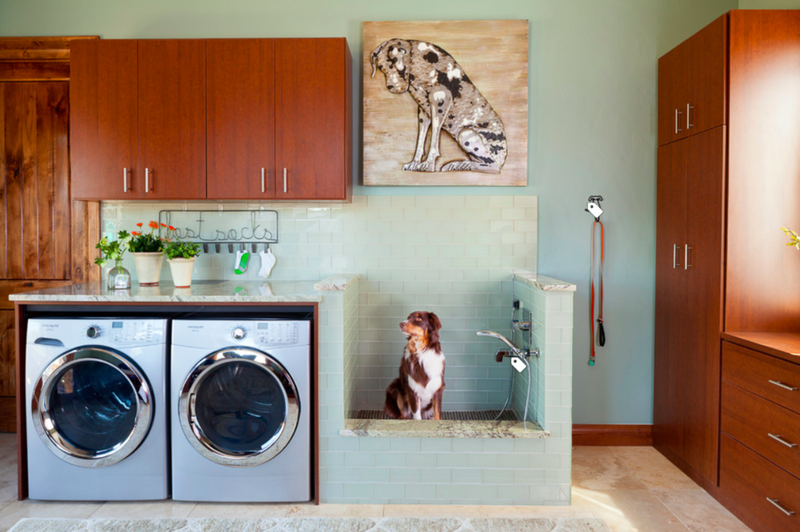 Bathe your dog in the wash station and wash you clothes all at the time. Keeps your bathroom mess-free. The under-stair area is perfectly utilized for our little ones (babies and dogs?)! I love how this under-stair design has a built in dog food bowl. Geneous! 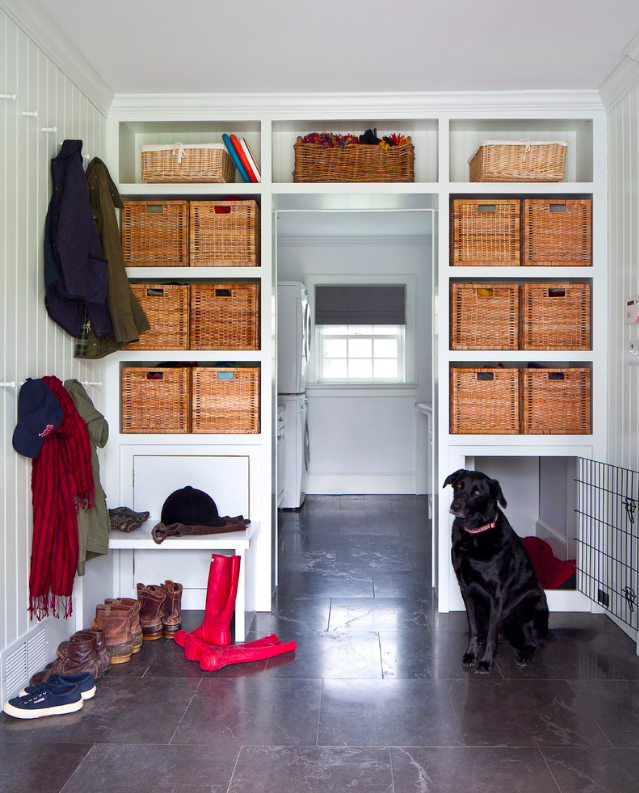 Much like the laundry room, the mudroom is a perfect landing place for the dogs. This idea of a built in dog crate is a super well thought out way of hiding something that is not very pretty. Dog day bed just the right size with built in storage to hide all those toys. For the king or queen of all dogs. Talk about luxury! A modern Le Corbusier inspired dog bed at the foot of your human bed. Punch a funny pillow on the bed! Accent pillow for the smart dog. This wallpaper in the bathroom is awesome at showing your dog love! A little more modern interpretation for a dog wallpaper. Again, let your crazy dog flag fly high! If you have any other dog design ideas, let me know so I can continue to day dream of Juno's and Okra's future pent house!